Classes began on Sunday, and the days that followed have been full of learning. Sunday began with shacharit, the optional morning prayer service. I have promised myself that I’ll go more often this year, so we’ll see if I stick to it or not. This was followed by a brief orientation, where I met more of my fellow students, including Sofia from South Africa-who it turns out lives on my street! After orientation was ulpan, my Hebrew class. As I mentioned before, I’m in level Bet, which is the third of five levels offered. Our teacher’s name is Edna, and despite the class being almost entirely in Hebrew, I can follow along pretty well. After lunch and mincha (the afternoon service), I had my first text class, of which I have two each afternoon. My first class is officially called The Place that God Will Choose: Holy Space and Place in the Tanakh, and is taught by Esther. We’ve been looking at examples of how holiness is commanded and executed in scripture, starting with Avram and Sarai. My second class on Sunday/Tuesday is Ta’amei Hamitzvot: The Reasons Behind the Commandments, taught by Shaiya. Shaiya is unlike any teacher I’ve had before (in a good way); his class is very philosophical and he sometimes shares his idea for a third, egalitarian, temple with us, while requesting that we view the Torah through the lens of an alien anthropologist. On Monday I had my second set of afternoon classes, which included Others and Otherness in Rabbinic Literatures with Yarden, and Tefillah Nusach with Saralee. On Monday we also had a lunch provided for participants under 30 to meet each other, and the best part was meeting someone else who eats pizza the same way I do-by removing the cheese. Tuesday (yesterday) was a big day for me. I started the day with shacharit, where Rabbi Joel taught us how to wrap tefillin, most of us for the first time. 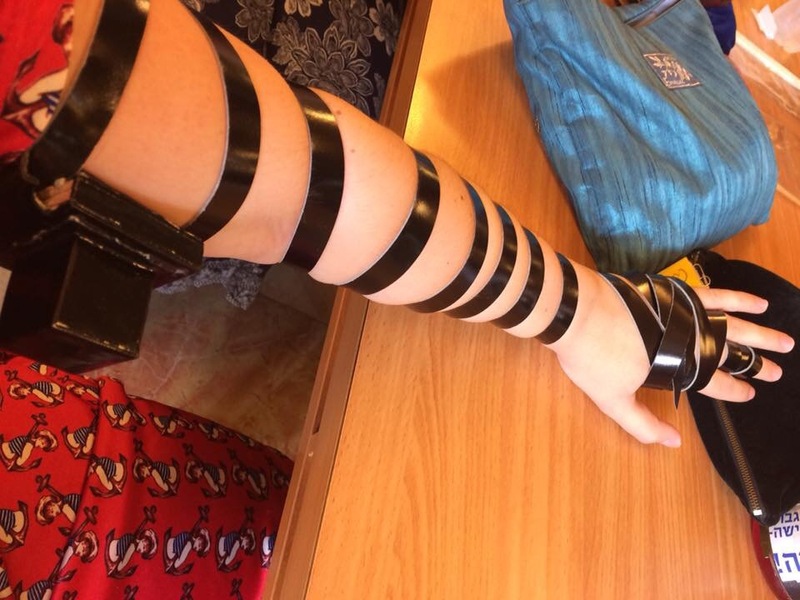 Laying tefillin is a daily mitzvah with which men are tasked completion, and is what is supposed to be the defining element of a boy reaching the age of Bar Mitzvah. Many women have taken on this mitzvah as well, but it’s certainly less common to see a woman with tefillin than a kippah or tallit. There are two tefillin boxes-one for the head and one for the arm. The tefillin shel rosh (of the head) is placed just below the hairline, and the tefillin shel yad (of the arm) is placed on the bicep and wrapped seven times down the forearm. I had been looking forward to taking part in this since last summer when I missed the instruction day. I was expecting it to be a big moment, for me to suddenly feel connected to the weekday morning service and feel as though I was taking part in something very important. It was more uncomfortable than anything-I tied the leather too tight around my elbow which served as a distraction throughout davening (praying). I think I realized that like anything else, it’s going to take practice to feel like a natural and wonderful thing to do, and it’s also perfectly okay to decide to not make this part of my routine long-term. Something that I did very much enjoy about this was being helped to lay them by two other women, who are older than me and have already been laying tefillin for some time. There’s something really beautiful about women helping other women to complete a mitzvah that is traditionally only afforded to men. The other news of the day comes in the form of a change to my mornings. On somewhat of a whim, I decided to take Talmud class in place of Hebrew ulpan. I really wanted to take class with Shoshana, the teacher, and I know that I won’t have the opportunity to study Talmud back at Oberlin. It wasn’t even 9:30 in the morning yet, but I had already taken on two things that women aren’t to do according to most Orthodox scholars. At first I thought that perhaps I had made a mistake-the Talmud is in Aramaic, which I don’t speak, and what about coming here to learn Hebrew? I warmed up to the class quickly, and I will be staying in it for the rest of the session. My class is small, only three people plus the teacher, and coincidentally happens to be all women. There’s an older German woman (who is nearly fluent in Aramaic), and a British girl who is a few years my junior. We’re all at very different levels, but it makes for interesting study as we all have something different to contribute. The turning point for me was the last 15 minutes of class when one of my classmates inquired about why we should bother with studying Talmud. The tractate we are studying dictates excruciatingly minute rules surrounding idolatry (masechet Avodah Zarah, for the curious), but in the span of class we confronted larger ideas of how to deal with people who differ from us and debated ideas of religious tolerance. This was ultimately the answer we arrived at regarding the importance of studying ancient (and sometimes boring) texts into the modern day. As a class of all women, we all agreed that these texts can be problematic and one is not always left with positive feelings about their faith afterwards. Sometimes the reaction to a particularly hard to hear text can be to shove the book back on the shelf rather than to continue to study. It’s important to know that this is an option, but we must not let that be a routine result of text study. Does this reaction prove that women shouldn’t study Talmud? Is it somewhat puzzling to be studying texts calling for own oppression? No and maybe, respectively. It’s incredibly powerful to be able to understand and reinterpret these texts into a way that affirms, rather than negates or oppresses, our identities. Shoshana said something that really stuck with me, which is that it’s important to take the opportunity to read these words which have been off-limits to us for so very long, precisely because we have been denied their usage. She feels (and I agree with her) that if women are going to continue to be treated like second-class citizens in many parts of the Jewish world, we need to be literate in these texts that are used against us. We must take this opportunity we are given to study for all the women who didn’t, don’t, and won’t have the opportunity to do so. Even though reading about what 1st century rabbis said about what is permitted to be in the hand of a statue does not exactly inspire passion in most, I feel that it is my obligation to bring new life into these texts that I would have found myself prohibited from only a few decades ago. I’m certainly no scholar and calling myself Jewishly literate would be a lie, but I will keep studying and working with the hope that one day I’ll be able to make a real contribution to Judaism. It’s currently Saturday night, which means that Shabbat just ended. I started preparing for Shabbat yesterday afternoon, which began with an accidental nap. I also got an e-mail from the CY with my ulpan (Hebrew class) placement. I’m in level Bet, which is the third of five levels. I was expecting to be in Bet or possibly Gimmel, but if Bet proves to be too easy I can switch levels. After showering and braiding my hair, I was ready to go to services. The CY has a Shabbat program for us at the beginning of both sessions, with services taking place at Moreshet Yisrael, the synagogue on their campus. Moreshet is one of the few Masorti/fully egalitarian synagogues in Jerusalem. The services are pretty American in style, although they were led by an Italian man yesterday. After services concluded, Yarden (a teacher at the CY) led a brief shiur (lesson). The best part of the shiur were his twin baby daughters he brought with him! Dinner at the Agron guest house was next on the schedule, which is where I got to meet some of my fellow students. There seemed to be far fewer people than last year-I don’t know if the second session is always bigger, or if more of the students chose to go elsewhere for Shabbat. I think I may have been the least tired person in attendance-many had just arrived that morning. After dinner I walked back to my house, followed by a few others who were going the same direction. This morning I had intended to go to morning services at Shira Hadasha, a shul which describes itself as “feminist Orthodox”. I had set my alarm (phone) for 7:30, but woke up at 11 due to my phone shutting off overnight. Tracey invited me to her Shabbat lunch, which was lovely. I spent the afternoon unpacking and making final preparations for class, which begins tomorrow. At 5, Tracey invited me to her Parashat HaShavua (weekly Torah portion) class, at the home of a woman named Rivki. It was a women’s class, and it was a wonderful mix of ages and observance levels. It was all in English, so I was able to (mostly) follow along well. It was really nice to meet a group of women who were all immigrants (I’m assuming) living in Jerusalem. We made havdalah after returning home, which concluded Shabbat. Tomorrow is the first day of classes! I left Cleveland Wednesday afternoon, on a flight to New York. No exciting international layover this time, just a few hours in JFK. I didn’t realize how big JFK is; going from terminal 8 to terminal 4 required exiting security. I had to check back in and get a new boarding pass, which meant going through El Al’s rigid security questions. It took about 5 minutes and I was made to answer questions on chagim (holidays), Jewish text, and various practices. I eventually got through and got to my gate where I talked to two girls my age who were on my flight; one was going on Birthright and the other is enlisting in the IDF. 11 hours later, I touched ground in Tel Aviv. After waiting in a long immigration line, I got my big suitcase and made my way out of the airport. Everything was remarkably familiar; I was able to find the shuttle I needed to take to Jerusalem, and I was able to communicate my address to the driver and ask which van to get in all in Hebrew. I had a grand plan in my mind of what it was going to be like to make the trip to Jerusalem. I had pictured watching the thicket and arid ground give way to cities, and watching Jerusalem become larger and larger until I finally entered. This plan went south when I fell asleep twenty minutes into the drive and woke up in Jerusalem. It felt almost anticlimactic-this city that I had dreamt of returning to for months was finally in front of my face, and reality hit that this place isn’t really my home, at least not yet. The driver wasn’t able to drop me off at my address because the streets were too narrow, so he had to drop me off a few streets away (this was the point at which we switched to English). I had no map and no real idea where I was, so I had to ask people to help me. After pulling two suitcases up multiple flights of stairs, I made it to my address and was greeted by Tracey, the woman I’m renting a room from, and her cat Kitzu. After resting for a bit, I set out to get groceries to last me through the end of Shabbat. The shuk, the big market in Jerusalem, is a mere 30 second walk from my house. 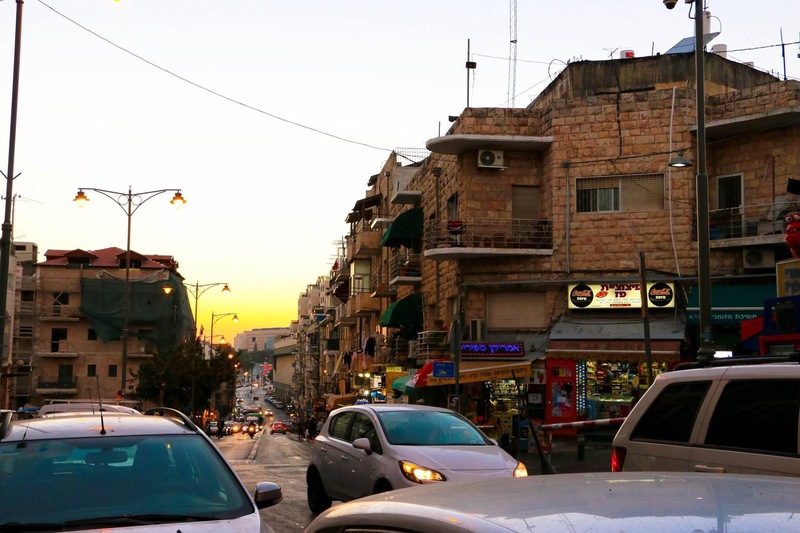 I decided I was too tired to handle the shuk, so instead I walked to Agron street to go to the Supersol, the grocery store across the street from the Yeshiva. Instead of thinking of what would be practical food to have, I went straight for the foods I’ve missed most over the last year. I sat down near the entrance to the shuk and watched the sun begin to set, casting a magnificent golden glow over the whole city and its inhabitants. As I took this in, I thought about how much has changed since last year, yet how much has remained the same. The city is still here, and looks much the same as it has for generations, and yet it feels different. Maybe it’s me who is different. I know my way around the city and can put together enough words to begin to speak. I know which synagogue feels like home. I know not to touch the cats and which bus to take and where to get juice and how to eat soup like an Israeli and so much I didn’t know a year ago, and yet I have so much to learn. I have so much to learn that can’t be taught in an ulpan classroom or the Beit Midrash. Yesterday (Friday) morning it occurred to me that all have to eat for two days is unidentified sliced meat (it’s chicken, I know now) and half a can of beans. With this in mind, I made a beeline for the shuk before it shut down and got some bread and mangoes. I’ve missed the mangoes here so, so much. Real mangoes, the kind that feel tingly on your tongue and run sticky juice down your face. After lunch I began to prepare for Shabbat, which I’ll write about soon in a separate post.